Bo’ness United midfielder Calum Scott hailed manager Stevie Kerrigan for bringing a winning mentality back to the club as the BUs all but ended Linlithgow Rose’s Super League title hopes with a 2-1 win. 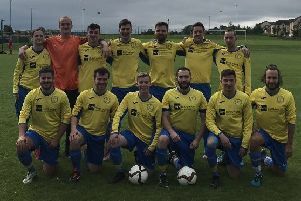 The Newtown Park men were hovering just above the relegation zone when Kerrigan took over the reins from Allan McGonigal in January, but now as they made it three victories on the trot, they don’t want the season to end. The result leaves Linlithgow seven points off league leaders Bonnyrigg Rose – a seemingly insurmountable gap with just five league games remaining. Bo’ness were well worth their win against their local rivals, with Scott, who equalised in the first half before being sent-off late on, claiming they could have scored a lot more. “It’s always good to get one over your fierce rivals,” said Scott. “These are the game in football you want to play in, you don’t need any motivation to play in these games. “To go a goal behind, a scrappy one at that, but to come back and win 2-1 and see the game out like we did was brilliant, although we probably could have scored a barrowload more. “Over recent weeks it’s been a busy schedule and we’ve shown that we’ve got depth to the squad. It’s been a joy, the boys have really picked up since Keggs has come in, it’s been really good. Bo’ness were given a let-off by referee Jordan Curran inside the opening minute as Ruari MacLennan was hauled down by BU captain Stuart Hunter who escaped with just a telling off in his ear. The visitors then struck the post through Michael Gemmell, and striker Marty Wright blazed over the bar when well positioned. Rose goalkeeper Darren Hill then did well to save from Scott when the winger ran though one-on-one. The home side had yet to test Bo’ness keeper Andrew Murphy, but they went ahead on 28 minutes when Colin Strickland pounced from close range following a corner-kick. Bo’ness deservedly pulled level on 39 minutes, with Scott reacting quickest to fire in the rebound following Nicky Prentice’s shot from outside the area which HIll could only parry. The turnaround was complete on the stroke of half-time when Wright was allowed a free header from Devon Jacobs’ free-kick and he duly took advantage. Murphy was certainly the busier of the two keepers after the break, as he firstly saved from Colin Leiper’s rasping volley and then produced the goods once more to deny Tommy Coyne’s top-corner-bound effort. Prentice might have made things easier for Bo’ness from his attempt at a corner, but his effort was cleared. Linlithgow boss Mark Bradley and his players were left furious when referee Curran waved away a strong penalty appeal after Owen Ronald’s shot appeared to strike the arm of Hunter. Coyne had Rose’s best chance of an equaliser after neat footwork to set himself up, but his shot just drifted agonisingly wide of the far post. Rose centre-back Gary Thom was shown a straight red-card after he hauled down substitute Marc Kelly who would have been in on goal, before Scott evened things up a minute later when he was shown a second yellow card. Rose boss Bradley felt referee Curran’s decision-making went against his side. He said: “I know we contributed to our own goals, but he’s got to officiate the game right. We could have been through to score to go one up, or they are down to ten men, but he just lets it go because it’s only ten seconds. “It’s getting beyond a joke. They took two minutes to make a sub and we only got two minutes of injury time, what’s going on?